In the 20th century, Mother Nature dictated the fate of this beach. Much like Napatree, after the two hurricanes (1938 and 1954) it was decided that rebuilding would not be allowed here. The beach, nearly two miles in length, is a pristine stretch of natural beauty wedged between the village of Weekapaug in Westerly and Quonochontaug in Charlestown. It is a barrier beach that protects a salt pond. The beach and conservation area is in fact privately owned but open to walking. Be sure to follow the rules posted on the signs. I choose the beach today partly for two reasons. First, I would be in the area for a later engagement, and secondly, after weeks of relentless snowfall I wanted to find a place where I could go without snowshoes and get my feet back on the ground. It was a fairly warm day in comparison with a slightly cold breeze, but most importantly, it was a sunny day. I could easily see Block Island to the south. The sand dunes and most of the beach was covered in nearly a foot of snow but the tides had cleared a section to walk along. I parked in the first lot just off of Spray Rock Road and found a marked path to the beach. Then I headed east to breachway. There were only a few others out enjoying the scene here. I came across several cormorants and geese as well as seagulls. After reaching the breachway, I retraced my steps back to the parking area. Parking is very limited here. Therefore, off season visits are probably the best times to come here. 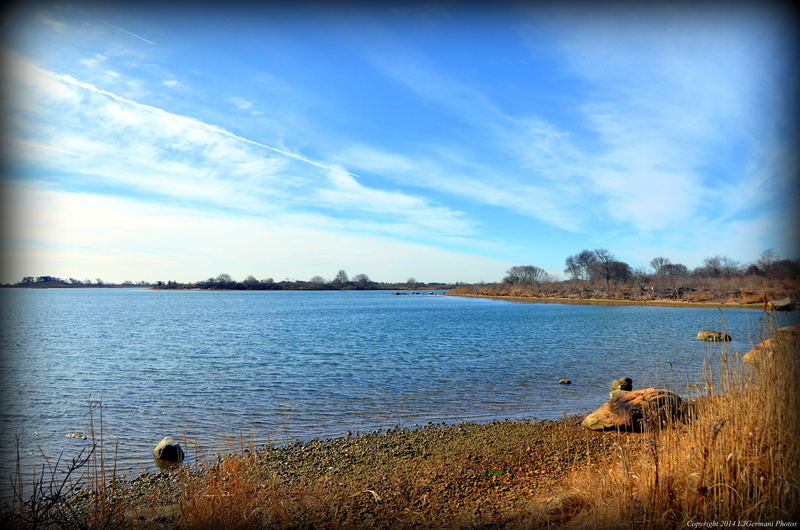 One of the smaller Audubon sites in Rhode Island, Lathrop offers a sweeping view of Winnapaug Pond. The trail, which is a cart path, starts at a small parking area along Shore Road. The cart path is flanked by several trees, shrubs, bushes, before entering an area of marsh. Needless to say I saw several birds here. After following the path to its end, I retraced my steps back to the parking area. Once an old Naval airfield that was used during World War II, Ninigret National Wildlife Refuge is now a place for hikers, photographers, and bird watchers. The property abuts the states largest coastal salt pond. I started the hike from the east parking lot first making a short loop along the coast near the end of runway 30. (The end of the runway is still here with its number clearly visible). The paths were still rather snow covered but very passable. I then made my way to Grassy Point. At the point there are sweeping views of the salt pond. There are some observation scopes here as well. From the point I retraced my steps until I got to the Cross Refuge Trail. Here I turned left and followed this trail to its end. Along the way I came across several deer track. Above were hawks, gulls, as well as several other birds including robins (first sign of spring). I then followed the shore of Foster Cove on its loop trail until I reached the west parking lot. From here I followed the Charlietown Runway Trail back to the east parking lot to finish the hike. Trail map can be found at: Ninigret.